In the latest revelation concerning the "mysterious Maltese Professor," Joseph Mifsud, and his involvement in the "Russiagate" saga, Disobedient Media can additionally reveal that Mifsud interacted on a number of occasions with individuals tied to think tanks known for engaging in "pay to play" behavior for the purposes of pushing specific policies on behalf of donors. The involvement of these institutes, which include the Atlantic Council, Brookings Institute and Open Society Foundation raises questions about whether or not certain private parties were involved with efforts to target Donald Trump's presidential campaign for their own political benefit. Disobedient Media broke coverage of Joseph Mifsud’s connections to UK intelligence and was also the first outlet to report on the findings of UK political analyst Chris Blackburn, who recounted evidence that included reference to Mifsud’s close relationship with Italian Senator Gianni Pittella. Pittella has been deemed in leaked documents to be a "reliable ally" of George Soros' Open Society Foundation. Joseph Mifsud has routinely and consistently interacted with various members of think tanks and institutions that as a general rule support internationalist policies. In the aftermath of the 2016 US Presidential Election, these interactions intensified as both think tanks and establishment media outlets began to increase their coverage of alleged "Russian collusion" narratives in an effort to justify ongoing investigations to the public. 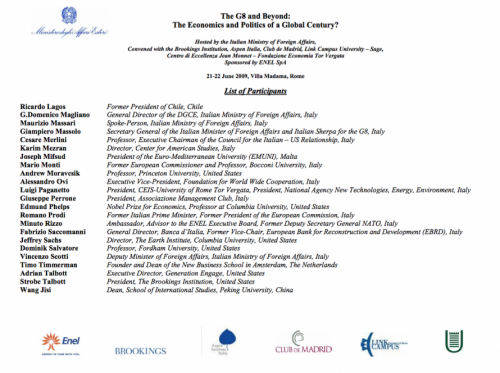 On June 21st and 22nd, 2009, Mifsud was listed as a participant in the Italian Ministry of Foreign Affairs-hosted "G8 and Beyond" convened with the Brookings Institution, Aspen, Club de Madrid and LINK Campus. The event was also attended by Strobe Talbott, the President of the Brookings Institution. Disobedient Media has previously highlighted research by Chris Blackburn, tying members of cyber-security firm Crowdstrike to the LINK Campus in Rome. Crowdstrike founder Dmitri Alperovitch acts as a Senior Fellow for the Atlantic Council. Mifsud has routinely aligned himself with pro-European Union parties and attended multiple events where members of the Atlantic Council and Open Society Foundation were also involved within the last several years. On June 28, 2016, Mifsud was listed as a signatory to a statement released by the European Council on Foreign Relations (ECFR) in response to the UK's Brexit vote. Other signatories included David Koranyi, Director of the Atlantic Council's Eurasian Energy Future Initiative, Jordi Vaquer, Director of the Open Society Initiative for Europe, Goran Buldioski, Director of the Open Society Initiative For Europe and George Soros. Since March 2018, the ECFR has removed Mifsud from their List of Members in an apparent attempt to distance themselves from this troubling affiliation. On May 7th through May 9th, 2017, Mifsud was a participant in a panel discussion as part of the Italian Ministry of Foreign Affairs and International Cooperation-sponsored "G7 International Forum" at the LINK Campus in Rome along with Andrea Montanino, a Chief Economist at the Atlantic Council. On May 21st, 2017, Mifsud spoke at the Riyadh Forum On Countering Extremism And Fighting Terrorism hosted by the King Faisal Center for Research and Islamic Studies and the Islamic Military Counter Terrorism Coalition. The event also featured multiple speakers from the Atlantic Council, including Nonresident Senior Fellow Elisabeth Kendall and Ashton B. Carter, who is listed as an Honorary Director at the Atlantic Council. On the 26th and 27th of June 2017 Mifsud attended the 10th annual council meeting of the European Council on Foreign Relations. Also present at the event was David Koranyi, the Director of the Atlantic Council's Energy Diplomacy Initiative. George Soros also appeared at the meeting along with his son, Alex Soros. The Atlantic Council is a NATO-supported think tank that is known for pushing pro European Union, anti-Russia narratives, including "black propaganda" claiming that Russia was likely involved with attempts to "hack" the 2016 US Presidential Elections and that Wikileaks is a pawn of the Russian government. However, Disobedient Media has previously reported that the Atlantic Council and other think tanks have a troubling history of taking money from foreign special interest groups and government agencies in return for pushing propaganda to support various initiatives around the globe. The New York Times has named the Atlantic Council along with the Brookings Institution and the Center for Strategic and International Studies as being think tanks which have made undisclosed “agreements” with foreign governments. The article denounced the Atlantic Council for having “opened a whole new window into an aspect of the influence-buying in Washington that has not previously been exposed.” Multiple legal experts cited by the New York Times said that these relationships with foreign powers may constitute a violation of the Foreign Agents Registration Act. In May 2016, a report by the Associated Press identified the Atlantic Council as one of a number of think tanks which had received funding from the Ploughshares Fund. The Ploughshares Fund is financed by George Soros’ Open Society Foundation. A May 5, 2016 article by the New York Times revealed that the Ploughshares Fund was a major player in efforts to sell the Iranian nuclear deal to the American public. The deal has been generally criticized as a foreign policy failure which resulted in the transfer of hundreds of billions of dollars to Iran without any concessions in return and has failed to prevent Iran from continuing to illegally test long range ICBM missiles in violation of both the deal and international sanctions. The Atlantic Council has released a number of glowing reviews of Soros’ “philanthropic” work and proudly lists a jaw-dropping number of various special interest groups, government agencies, foreign governments and well connected, wealthy individual patrons among its donors. Highlights include the foundation of Ukranian oligarch Victor Pinchuk, The Open Society Foundation, the United Arab Emirates, Bahaa Hariri, the billionaire brother of Lebanese prime minister Saad Hariri, Rockefeller Brothers Fund, Inc., NATO, the United States Department of State, and Lockheed Martin Corporation. A donor list from 2015 also names the Turkish Ministry of Energy & National Resources, whose head Berat Albayrak was the subject of leaks released by publishing giant Wikileaks exposing increasing political oppression in Turkey and the involvement of the Ministry in providing material support to the terror group ISIS. The Brookings Institution's Contributor List also mentions many of the same donors who fund the Atlantic Council. Common supporters include Victor Pinchuk, The Open Society Foundation, The Rockefeller Foundation, Lockheed Martin Corporation and The Boeing Company. Brookings has also played a central role in helping to stoke the flames of the "Russiagate" story. Its staff includes Benjamin Wittes, a Senior Fellow at the Brookings Institution who admitted to leaking information given to him by James Comey about President Donald Trump to the New York Times. The heavy emphasis placed on narrative pushing by the Atlantic Council and Brookings Institution is hardly surprising and has only intensified in 2018. In May 2018, a panel convened by the Council on Foreign Relations openly endorsed the use of propaganda on Western populations to combat what they claim to be "disinformation and fake news." The consistent interactions and connections between Mifsud and individuals tied to think tanks with a vested interest in pushing specific policy narratives leads to skepticism about claims that Russia systemically interfered with American elections. The damage that has been done not only to the reputation of hardworking intelligence professionals but to the very ideals of Western democracy internationally will take some time to fully repair. While much attention has been given to the identities of the intelligence and government officials involved with the "Spygate" scandal, very little has been said about the private parties who may have used them for their own benefit. There is a plethora of international groups such as the Open Society Foundation, NATO and other individuals and organizations around the world which support these think tanks that have a proven history of pushing propaganda on behalf of their beneficiaries. Mifsud's ties to such groups that support an internationalist political agenda which has been disrupted by political events over the past several years raise serious questions about the identities of the actual parties who interfered with democratic processes and institutions in the United States.